Barcelona came out on top in a brilliantly topsy-turvy Clasico. Carlo Ancelotti named his expected starting XI. Gerardo Martino selected Neymar rather than Pedro Rodriguez or Alexis Sanchez as his second forward, and continued with Andres Iniesta tucking inside from the left, as he’s often done in big games. This was the most fast-paced game you’ll see all season, with neither side controlling the game but both attacking relentlessly. Both fielded roughly their first-choice starting XI, and played attacking football throughout. Often the the pattern of these games has been rather stunted because everyone knows the situation – Barcelona will try to dictate the game, Real have to work out how to respond. That wasn’t the case here. Barcelona still had more possession, but Real did little to alter their regular tactics, and the first half, in particular, was simply about who could play better football. The first half was played at such unbelievable speed it often defied analysis. 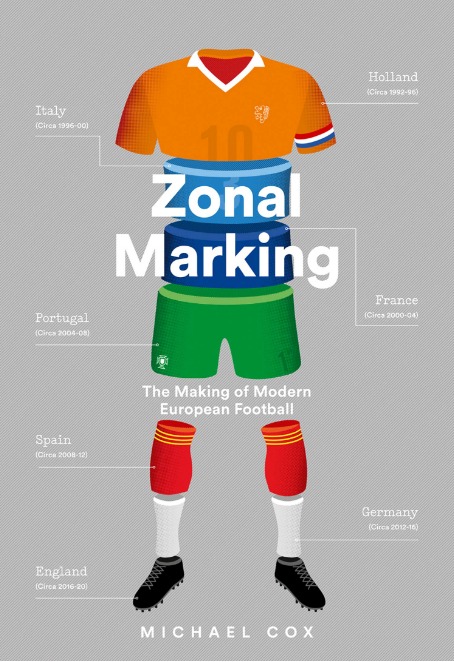 The midfield zone, in particular, possessed an astonishing array of technical quality, with no true destroyers or runners, and almost every player in that zone being extremely good at using the ball quickly and efficiently. A huge number of the attacks were direct breaks from deep positions – Real still retain a great counter-attacking edge, particularly considering the nature of their two star attackers, while Barcelona are more counter-attacking than at any point in the last six years, too. This meant two things. First, the game was constantly end-to-end, and neither side ever enjoyed much control. Second, the goals didn’t occur in relation to the balance of the game at one particular moment. Often, one side were having a decent spell – and would end up conceding the next goal. The tactical battle, in terms of formations, was difficult to pay too much attention to, such was the rapid nature of turnovers. Fabregas and Modric should have been tracking each other, but often didn’t. Marcelo and Neymar seemed happy to attack in advance of the other. Real conceded too much space between the lines, Barca too much in the wide areas. The game was a tactical shambles, but thrilling for the first 45 minutes. There was only one interesting positional feature that was unquestionably the result of managerial design. Javier Mascherano and Gerard Pique switched sides – Mascherano to the right, Pique to the left of the centre-back duo. This was almost certainly because Martino wanted Mascherano, rather than Pique, who lacks speed, to act as cover against Ronaldo. In the 5-0 Clasico in 2010, Pep Guardiola actually asked his centre-backs to switch according to which side Ronaldo was on – Puyol would follow him across when he switched flanks. It was also interesting that Barcelona dominated possession so clearly (68%, albeit including a period when Real were down to ten men) considering Ancelotti has tried to pack his midfield with passers, and said he’d hope to win the midfield battle here. Instead, the confidence of Xavi Hernandez and Sergio Busquets in possession was crucial in asserting Barca’s control of possession – if not necessarily control of the game. The first half’s key feature, and the most fascinating aspect in a long-term context, was the role of Angel Di Maria. He played as a shuttler on the left of Real’s midfield trio, and while he’s often regarded as a winger, excelling on the right of Jose Mourinho’s 4-2-3-1 by providing balance on the opposite flank to Ronaldo, he’s actually more at home in this deeper role. He made his name there at Benfica, and played a similar role for Argentina at the last World Cup. Di Maria created Real’s first two goals, both finished expertly by Karim Benzema – and also teed up the Frenchman for what should have been his hattrick goal – Pique got back and blocked on the line. The interesting thing about Di Maria’s performance was that he essentially acted as a winger despite Real’s three-man midfield, with his drifts out to that flank unnoticed by Barca. Neymar was too high up the pitch to offer support, while Daniel Alves was sucked inside by Ronaldo, who was also troubling Mascherano. It meant Di Maria continually got time out on that flank. He was able to cross unchallenged (for the first goal), or pick up speed before dribbling past opponents (for the other chances he made). No-one knew who was supposed to be stopping him. 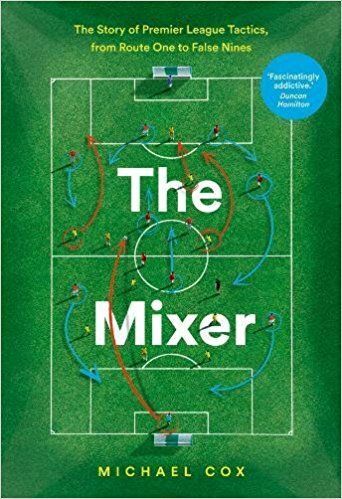 Xavi Hernandez was theoretically his closest opponent, but it feels unnatural for central players to track opponents into wider roles – it’s a simple, natural part of football that wide players track opponents inside, but central players let opponents go free when they drift wide. They protect the centre of the pitch. But with teams increasingly protecting that central zone, it’s often easier to make progress down the flanks and cause overloads in those positions. That’s why the concept of the central winger is less ridiculous than it sounds – if you can create a 3 v 2 out wide, and a triangle to work the ball past the opposition, it’s difficult for them to get players out there to stop it. Di Maria certainly hasn’t invented this concept – he’s not even the first to do something similar this week. In a sparkling performance against Olympiakos on Wednesday night, Ryan Giggs drifted out to the left from a central position, and was given all the time he liked to cross and find Wayne Rooney for a near-post header. Giggs has played that role before to great effect – he crossed unattended for Antonio Valencia’s opener against Arsenal two seasons ago, for example. James Milner caused Manchester United problems in a similar respect the previous season – right-winger David Silva drifted inside, central midfielder Milner constantly overlapped into space. Who picks him up? Crossing isn’t in vogue at the moment, but that doesn’t mean using the flanks can’t be effective. One of David Moyes’ key training ground sessions involves creating 3 v 2 situations in wide areas, which is only possible (in a 4-2-3-1 or 4-3-3 system) if a central player moves wide. Moyes might not be the most fashionable coach at the moment, but the method worked well for him at Everton, often with Leon Osman moving wide to become the third wide player. Rafael Benitez, meanwhile, has discussed a rise in the number of goals from cut-backs recently, and cutting the ball back is a way to create chances from wide without simply lobbing it into the box. Di Maria’s performance here was the best possible example of this – the only problem, of course, was that by playing so aggressively he inevitably left his defence unprotected, and he therefore contributed to Real’s lack of control. Di Maria’s role might have been the most interesting, but he wasn’t the star performer. That honour fell to Lionel Messi, who scored a hattrick with two penalties and a well-taken snapshot. As ever, with Messi, his goalscoring record doesn’t do justice to his all-round contribution. From the first five minutes, it was evident Real had no real plan for stopping him drifting into deeper positions. In fact, they seemed utterly surprised by the fact he continually took up those positions, despite the fact he’s done so in the past dozen Clasicos. Real have had various plans for stopping him in the past – sometimes a centre-back tracks him out, sometimes a defender is used in the holding role to stop him (often Pepe, but Sergio Ramos in the reverse fixture). Here, Real simply let him go, and he wreaked havoc with constant through-balls, particularly for Neymar. He’d set up Andres Iniesta for the opener within seven minutes. 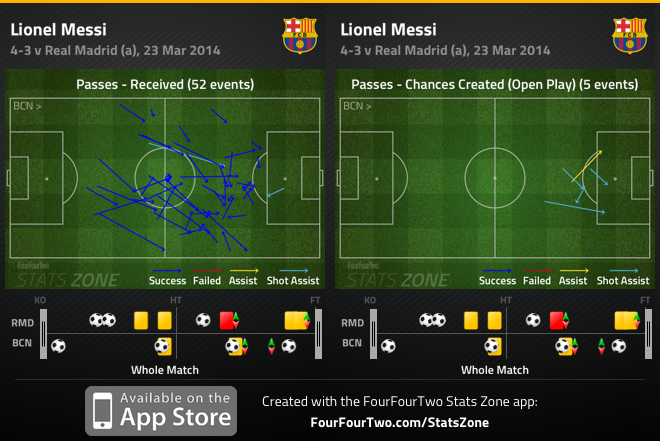 Part of this was simply genius from Messi, but Real’s surprising lack of midfield structure was also a problem. Xabi Alonso got drawn higher up the pitch to close down opponents – particularly Cesc Fabregas, who did little on the ball himself, but along with Hernandez and Iniesta managed to overload Real in that zone, seemingly allowing Messi freedom a little higher up. Even then, Messi should have been closed down quicker. For the chance he created for Neymar after just three minutes, he had 25 yards of space to himself between the lines, and although that was an extreme example, it set the tone for the game. This was the first time Real’s ultra-technical central midfield trio has really been exposed, and they needed a more defensively aware player in that zone. Supposedly, Alonso believes this 4-3-3 is too open against strong opposition, and thinks he needs more help defensively – if so, this game supports his case. Not only were Real unable to handle Messi moving away from their defence, they also struggled to deal with his runs in behind – as shown by the ease he broke past the defence to receive a Fabregas pass after 15 minutes. Curiously, that was one of the few occasions the Real centre-backs ’split’, with Pepe moving high up the pitch to close down, but it’s the kind of thing they should have been doing when Messi was in front of them, rather when he was going in behind. The third player who played an interesting role was Benzema. Usually, the Frenchman’s role at Real Madrid is to be the functional, unspectacular forward who is selfless so the likes of Bale and Ronaldo can star. This was a complete role reversal. Were you watching Real Madrid for the first time, you’d think Bale, Ronaldo and Di Maria were in the side primarily to service Benzema with a stream of crosses and cut-backs. The vast majority came from Di Maria. Benzema scored two fine goals, but probably should have had at least two more, and amazingly he had eight shots in total, despite playing just 66 minutes. While he’s probably played better for Real Madrid, this was his most dominant performance. The surprising thing was that Bale and Ronaldo were relatively quiet in a game which theoretically suited them, being about end-to-end, quick, direct football. As so often, after a ludicrously open first half, the managers calmed things down at half-time, the tempo dropped after the break, and the second period was based around penalty decisions – two for Barca, one for Real. Perhaps the key to the tactical battle was the first Barcelona penalty incident, because it resulted in the dismissal of Ramos for bringing down Neymar. Inevitably, Ancelotti had to bring on an extra centre-back, Raphael Varane, and he chose to take off Benzema – despite his obvious influence on the game. Real moved to a 4-4-1, with Ronaldo upfront and Di Maria now permanently on the left. At this point, it was highly surprising Martino didn’t immediately bring on an extra attacker. He introduced Pedro Rodriguez, but in place of Neymar rather than in addition to him – he waited ten more minutes until bringing on Alexis Sanchez in place of Fabregas, and moving to a ‘proper’ 4-3-3. On one hand Barca wasted this period of time, on the other Pedro had a good impact, primarily with his positioning and movement. He simply understands how to create space for others better than Neymar, and in the final period of the game Alves became an attacking force for the first time (partly, of course, because he wasn’t being overloaded by Ronaldo and Di Maria and could fly forward). Alves hit the post with the score at 3-3, and his late impact was reminiscent of his display in the closing stages of the win at Manchester City, who were also down to ten men. When playing with a man disadvantage, the last player you’d want to play against is Alves, and he was much more attack-minded in the second half. This could have gone either way. The game was extremely open, which made for a great spectacle, but it was so open that the tactical battle was barely discernible at points. It’s difficult to believe either manager was truly comfortable with this, which partly explains why the pace slowed after the break, once they’d had their chance to interfere. The main lesson, in such a crazy game, is that attackers with the greatest natural appreciation of space – Messi, Di Maria, Iniesta – are the ones who thrive. It’s doubtful Di Maria was instructed to play as he did, for example – he just realised the space was out wide, and shuttled out there to exploit it. This was a players’ game rather than a coaches’ game – and the most talented player on the pitch, Messi, was the one who had the greatest impact. Real Madrid’s midfield getting exposed again in a big match. This just further proves how important Khedira was for their Cl run in. I also thought that pique handled bale and ronaldo well. There is nothing more to say about the little genius called messi. Out of this world! One can only hope the copa del rey final can be as open as this one was! Agreed. Unrewarding role for him on the right. If he can’t play on the left, better start him on the bench and keep him as supersub while Pedro and Alexis tire the opponent..
1) I was surprised at how high up the pitch RM were playing. From the beginning, I could see that the intent was not to just sit back and absorb pressure. 3) The standout players from the game were obviously Iniesta, Messi, Di Maria, and Benzema, with the latter two’s influence gradually waning as the game went to the second half. 4) Alonso is too exposed defensively. I think the loss of Khedira was both a blessing and curse to the team. Best analysis I have read on ZM. First half was a sandlot affair. Some of the world’s most gifted and experienced footballers acting as if they were settling a bar bet. Second half started out much more controlled, but became less disciplined as time wore on, though. The capstone had to be Iniesta hallucinogenically dribbling past Alonzo and somebody else (Carvajal?) in the middle of the park—something he would otherwise never, ever try. It was football of the romantic, Pelé-esque genre, like a throwback to the 1950s except with a great number of midfielders (eight, if one counts Messi as an attacking midfielder in this game). A match in which the players, aware of the stakes of a knocking out the other side (and generally unwilling to draw), seem to have ignored/overruled their managers and duked it out, playground-style. Real lost, but so did both Martino and Ancelotti, in a way. History repeating itself? Ancelotti fitting as many playmakers as he can into midfield like he did with AC Milan 10 years ago. The difference being that it is slowly becoming evident that Real Madrid lacks bite in midfield. With Milan it happened overnight in the CL thanks to Deportivo La Coruna, and since Milan have played with at least 2, but sometimes even as many as 4 “battlers” in midfield. “Creating 3 v 2 situations in wide areas” is what Atlético de Madrid’s midfield playing plan is all about: Filipe Luis, Arda Turan and Koke working on the left flank. the most important thing that i had seen in this classico is messi playing as a member of a team and he is supplying others rather than the other way around .earlier the team used to play around messi and used to get supply for him but here he is creating for the team . now there are a few points that i like to add . madrid pressed barca in first few min but pepe or ramos never followed or tried to get tight on messi . he was dropping from his forward position in to the hole and first he picked neymar who was stupid as he was all the match . next time he picked iniesta who just put them in front . secondly why was madrid playing a high line . it is not as if pepe or ramos dont have pace but to test that against iniesta, messi or neymar (who even though was poor but his run caused the red card .) . there is a basic rule you cannot play high line if you dont defend from the top . you cannot let the opposition play and play high line without pressing the ball . not only are barca good in pressing but they are actually very good in one on one situations and are very cool on the ball . madrid just committed the crime of playing too theoretical (holding high line limiting space and all that ). they just gave too much space for messi and neymar to run behind and left diego lopez exposed . now there was another problem i thought there was with modric’s positioning . normally under mouriniho real will have two banks of four and the two central midfielders will have little space among them . not more than 5 to 10 yards . here in this classico . modric who was leaving his position which had to be besides alonso . instead he was trying to press busquestus . he should had kept the shape . the first was resultant of that . under mouriniho messi wouldnt had found time and space on the ball and that why past season real were successful against barca . i think in the first half ancelotti was seen screaming at modric to keep the shape . you had correctly chided benzema to be honest its not about injury but he is just not good in a one on one situation and when pressed just buckles up ( that is why he was called a cat by mouriniho ) . another problem that i saw was that madrids attacks were not that fast as they were under mouriniho . now barca may had won the contest . there are many a question marks remaining . xavi, alves just dont have the legs to keep up with the game and in the first half it looked as if the game had just blown past them . you could how easily alves was getting beaten in the race and xavi was letting his opposite number di maria a free reign . he should had help cover alves on the right flank . which he didnt . piqie and maschrano were all over the place and they need to get their priorities right as to who marks whom . they need to mark the player inside the box perfectly or they will just get punished . now last but most important . last week or so there was a scout report article . now why i am writing this is you could see as to how much of a sensation neymar was with santos and he has fully flopped . so i would suggest there should be an indirect buy . the big clubs should let the small clubs buy the players for which they wont have to pay excessively . now they can test the player as to whether he can be fit for the league and can buy from them . so the transaction will cost a fraction than the direct buying . will explain if asked . Sir, Messi is not just the highest goal scorer in classicos, but also the highest assist maker in classico history. In liga matches too, he has the same number of assists as Xavi’s ,may plus or minus one. He is not just a goal scorer, but like a 3 or 4 player in one. He always picks up unbelievable passes for his team mates. Messi has always played a supplier role in Clasicos. For example, in the 5-0 he didn’t score a single time! Rather he was assisting. Of course sometimes he’s more of a scorer, sometimes more a supplier, but neither is a new development. I disagree that Neymar has “fully flopped”. He’s a bit off-form but he has been key at points – without him, Barca don’t win the first Clasico nor the Supercup. His stats aren’t bad either. It’s his first year in Europe, he’s quite young. Calm down. And I don’t understand whose expenses would go down in your situation. If Barcelona arranged for Neymar to have one season at Celta for example, Neymar could have just said no and gone to Madrid or Bayern or whomever promises him a spot from the get-go. Santos would say no to the cheaper buy option and just try to sell to someone who gives them a bigger sum from the get-go. I think it was rather obvious that Real were playing a quite standard 442 formation, which is a formation I’ve often seen Barca struggle against. Anyways, what a great game to watch. Also thanks for the excellent website. Hi Michael, did you link to the wrong Rafa Benitez article, or am I being slow? I can’t see anything in there about goals being scored from cutbacks. One thing: could you do something about the “central winger article?” Two of the graphics don’t show, so i can’t share with/convert my friends to ZM! Sorry – thanks, will try to fix that…. An excellent review for arguably the best football match in some time. 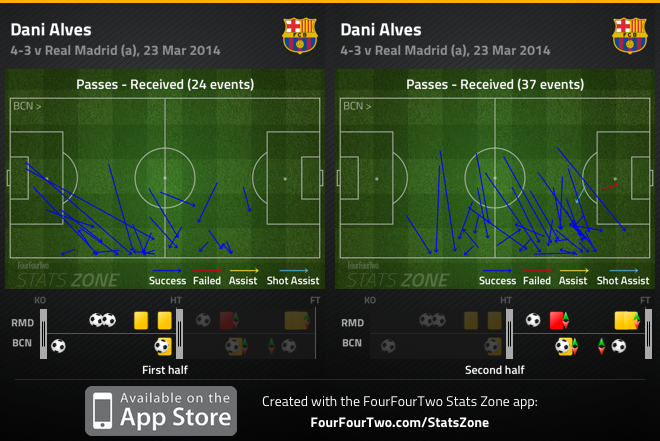 - even in the first half, there were moments when Barca out passed Real with their normal control. ZM, would you ignore the fact that the first Barca goal came from 23 or 24 passes? - I am surprised how Madrid didnt care about Messi like usually. Ramos or Pepe were always having an eye on him, but every since the 2-6 match, they alwats have had two players on him. Give him even a little bit of space, and its danger. I dont think Real might attack like this in the Copa finals. Busquets 99% pass accuracy was an astonishing stat..given the game it was…i.e not safe & controlled stuff but end to end. and he won far more fouls than he gave away. he’s got that dragback trick (see youtube ) down to a fine art which makes him almost impossible to close down. i keep hearing people talk about Real faves for the CL. this game showed that defence is too great. always had doubts about Pepe. not seen much of Carvajal. Marcelo is clearly better going fwd than back. some pundits i rate & trust like Marcotti..speak very highly of Varane…don’t understand why he isn’t playing more. Varane had been out a long time with an injury. Meanwhile Pepe has been brilliant. Ramos is vice-captain and playing pretty well too. Varane has been OK, but it’s certainly understandable why he hasn’t yet retaken his place. Of course in hindsight, if you ship 4 goals, you start to wonder. Micheal’s greatest analysis in 2014 on one of the most eventful game this year in La Liga or perhaps in Europe as well. Real Madrid continues to have problems in big games this season, which worries me in a way heading towards the end of the season. Barcelona will not go away with the Copa Del Rey final and a possible semi-final or final meeting in the CL. I have to agree with the fact that Real Madrid needs a “destroyer” in such games, Khedira to name the least. If fit before the end of the season, how to insert Khedira with Alonso in the same formation? Do you revert back to a 4-2-3-1 ? Benzema truly is a world class player, despite his two goals I felt justice would have been made if he would have been kept until the end of the game. Does anyone think Varane should have started the game? Aside from all the controversy towards this game, Real Madrid cannot be conceded that many goals at home, had this been a Champions league tie with a reverse fixture in Barcelona, it would have been a difficult turn around. Ancelotti started his strongest XI, although personally I still think Casillas should be playing those “big games” that Ancelotti stated he would early in the season. Lopez cannot be blamed for any of the goals, but sometimes in spirit of San Iker, he brings a certain vibe to the game and to his back line that could have a slight improvement or discipline. Time can only tell if he Casillas will stand strong in the final and remaining CL fixtures. Real Madrid, as I said before since october, will not win La Liga, neither will Barcelona thanks to a last day fixture. However, they are are line of winning both cups thanks to a certain Iker Casillas, the true Captain of this team. Excellent analysis as usual, and two things hit me that were commented on before the match by many. One was if Alba could actually manage to defend, Barça would have an easier time of things. And aside from a couple of moments, he kept Bale in very good check, and had a very good overall match. The other thing was expressed above by Dushant Atalkar, in Messi vs team Barça. It is something that not just Martino, but every coach since Guardiola has been wrestling with, essentially how to make Barça play as a team with Messi as part of it, rather than a collection of great players playing for Messi. During the Mourinho years and in recent matches for too many times, the latter has been the case. With the extended Messi injury absence, Barça got a taste of what it was like to play as a team. The ball movement was faster, threats were more numerous and everyone was scoring, from Sanchez to Fabregas. When Messi returned, there was some reversion, the team playing for Messi again. The City tie was the first time that you began to see signs of the team+Messi, and a lot of that contributed to the result of that tie. It was in its fullest flower during the Classic, kicked off by the Iniesta goal. Between feeding Iniesta, Fabregas making runs and Neymar having an influence, it wasn’t as much that the influence of Messi was diminished as much as it became part of the overall attack. This made it significantly more effective. People snark and snarl about Neymar and what he cost, but his presence in the box made that second goal (scored by Messi) possible. Barça has hertofore not had a player who would draw 2-3 men in the box before while being a legitimate threat to score. Neymar was surrounded, thus creating space for Messi, and the rest is history. Mourinho had success against Barça because he had RM playing as a destructive force. (Not a judgment, just a tactic). Ancelotti probably was a little arrogant in that he decided to play his players against Barça’s players. Not many teams are going to win that battle of individual quality, particularly with Messi on the other side. Thanks for that analysis. You’re a born educator. Just like against mancity away it was annoying to see Martino didn’t went for the kill straight away, he should take more advantage of opponents needing to adjust to the new situation. Also i dislike in every big match he’s fielding names and not the best squad. Pedro and Sanchez are both better options up front then Neymar who still isn’t good enough at the moment. He played well for Brazil against South Africa but it seems like on the highest level his functional technique isn’t good enough. As a Barca fan it’s still very frustrating to see Thiago playing at Bayern and see Fabregas playing for us. Fabregas is a good player but not for this team, it’s not like he does everything wrong but just minor important things. Most of the time as he loses the ball he doesn’t really chase down his opponent, like by the 2-1 of Madrid, he lost the ball after a pass of Iniesta and then first he gets up slowly and then after like 5 seconds he still isn’t close to Modric who can walk across the center of the field with the ball and set up the attack causing the 2-1. In games against lesser opponents his defensive attitude is even worse. Xabi Alonso comment on Madrids midfield is also quite funny, he just isn’t good enough (anymore) to play this way if he gets pressured so it isn’t the system that is wrong it’s his ability to play that way. He was by far the worst player on the pitch and totally invisible till he caused a penalty. It would really surprise me if he stays in the starting line up next season. I like to call that strategy “going around Busquets”. I almost wonder if do Maria knew to go wide from how Morinho attacked Barca. That was the major feature of them last year and for all his faults I would choose Morinho over just about any other if I needed to win a Clasico. Brilliant analysis! great job as always. wow! so I guess this means Ronaldo has no appreciation of space…..